Pumpkin Carving. 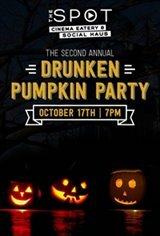 But Drunker.On Wednesday, October 17th at 7pm, join us at our Haus for our 2nd annual Drunken Pumpkin party! We will supply pumpkins, carving tools, decorations, and snacks. Not only will we have pumpkin carving, we will be showing Hocus Pocus for free starting at 8pm! If that doesn't sound great already, we will have prizes, food and drink specials, and of course, our full menu available all night long! Be sure to wear a costume and get ready to get spooky!This event will be 18+ only. Tickets are $12 per pumpkin.